As a complement to my previous post Recent 3 Months U.S. 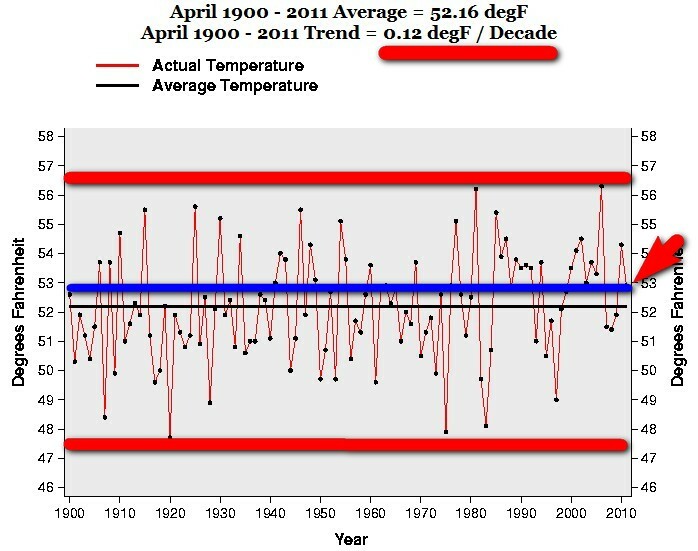 Temperature trend/decade – It is getting cooler and cooler 2, and Recent 6 Months U.S. 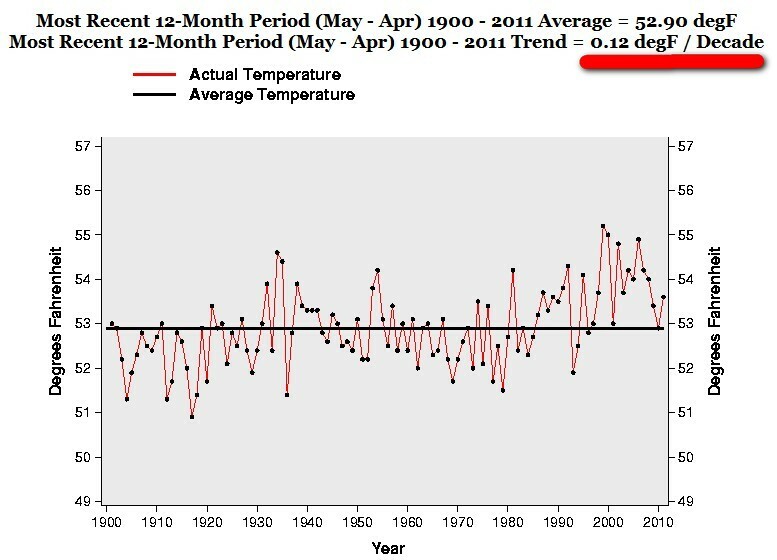 Temperature trend/decade – It is getting cooler and cooler, I thought I also would look at the recent 12 months (May-April) US temperature from a “historic” perspective. To see how the decade trends have evolved during the last 111 years. So the “warming trend” 2000-2011 is exactly – 0.50 F degrees COOLER a decade. That is a whopping – 5.0 F COOLER in 100 years. Brrr! 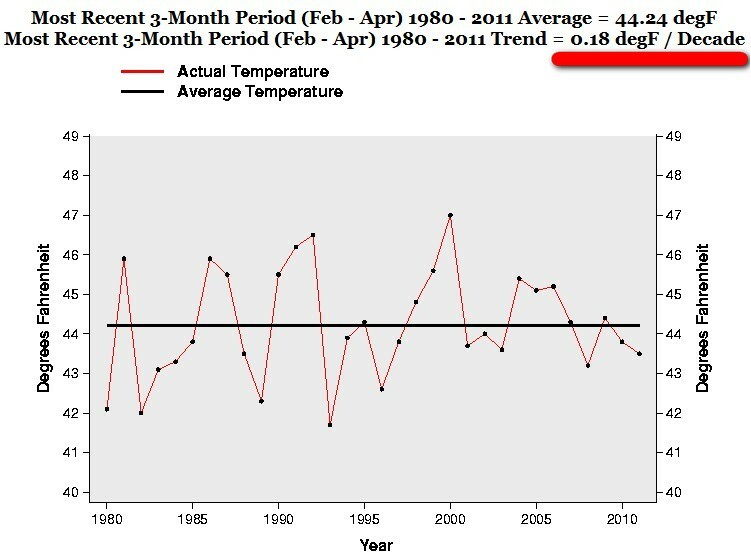 The recent 12 months trend 1980-2011 is exactly0.34 F degrees a decade. 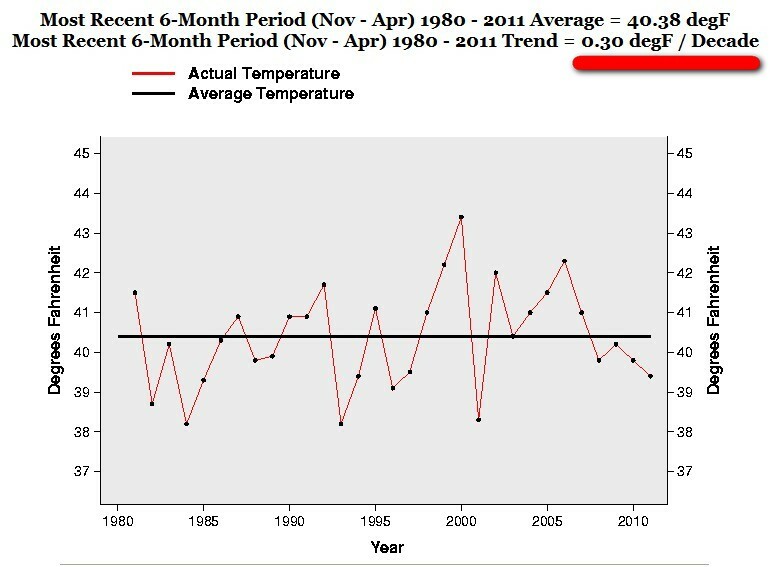 The recent 12 months trend 1990-2011 is exactly 0.28 F degrees a decade. The recent 12 months trend 2000-2011 is exactly – 0.50 F degrees a decade. 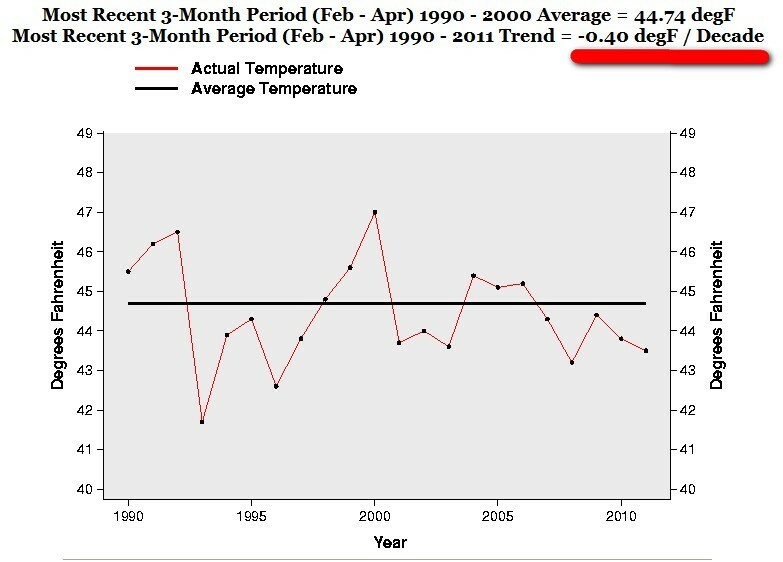 And remember, the latest 3 Month “warming trend” 2000-2011 is exactly – 1.44 F degrees COOLER a decade. 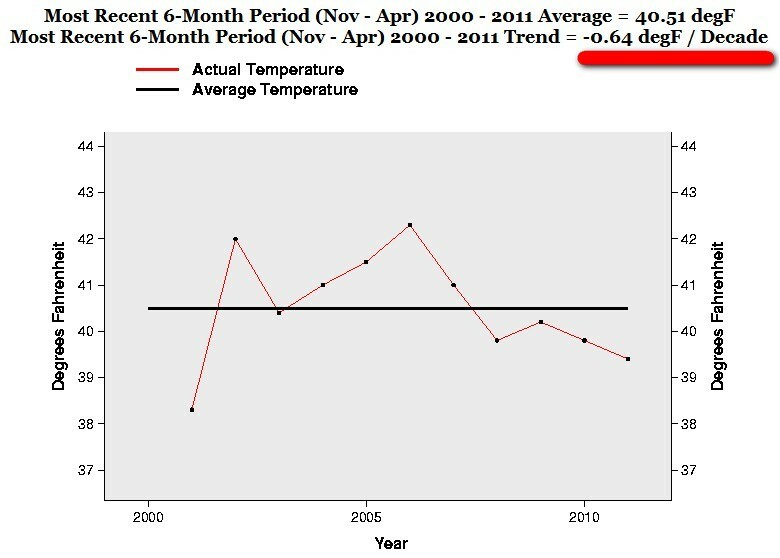 And the latest 6 Month “warming trend” 2000-2011 is exactly – 0.64 F degrees COOLER a decade. So the “warming trend” is really accelerating wouldn’t you say. Another brilliant and glorious example of RAPID WARMING and an eminent treat to humankind! As a complement to my previous post Recent 3 Months U.S. Temperature trend/decade – It is getting cooler and cooler 2, I thought it also would be interesting to look at the recent 6 months (November-April) US temperature from a “historic” perspective. To see how the decade trends have evolved during the last 111 years. So the “warming trend” 2000-2011 is exactly – 0.64 F degrees COOLER a decade. That is a whopping – 6.4 F COOLER in 100 years. Take cover! 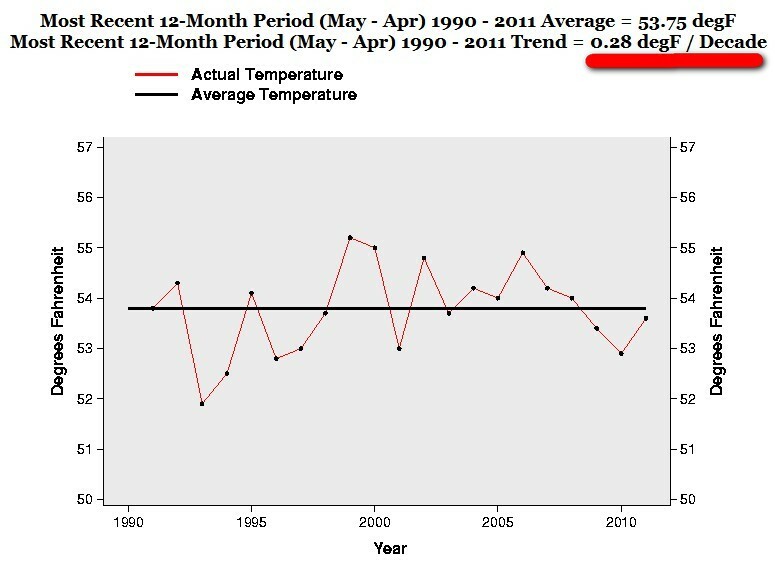 The recent 6 months trend 1980-2011 is exactly 0.30 F degrees a decade. 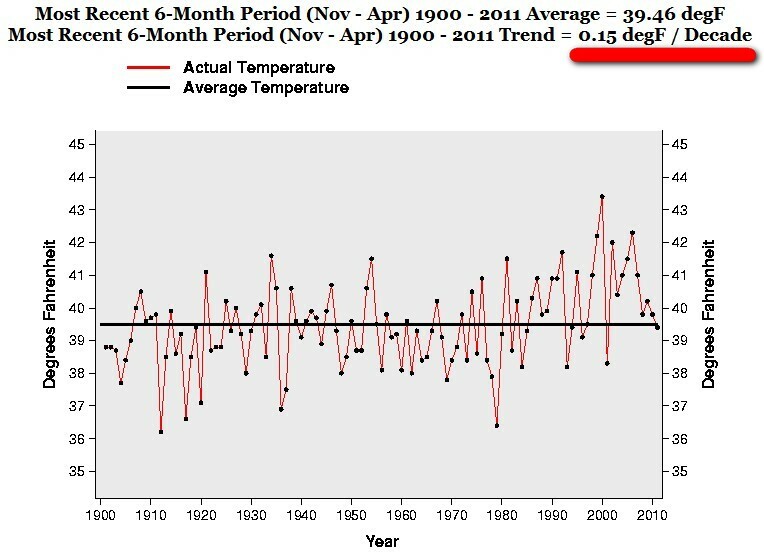 The recent 6 months trend 1990-2011 is exactly 0.07 F degrees a decade. The recent 6 months trend 2000-2011 is exactly – 0.64 F degrees a decade. As a complement to my previous post April U.S. Temperature – 3.37 F cooler than the warmest April, I thought it would be interesting to look at the recent 3 months (February-April) US temperature from a “historic” perspective. To see how the decade trends have evolved during the last 111 years. 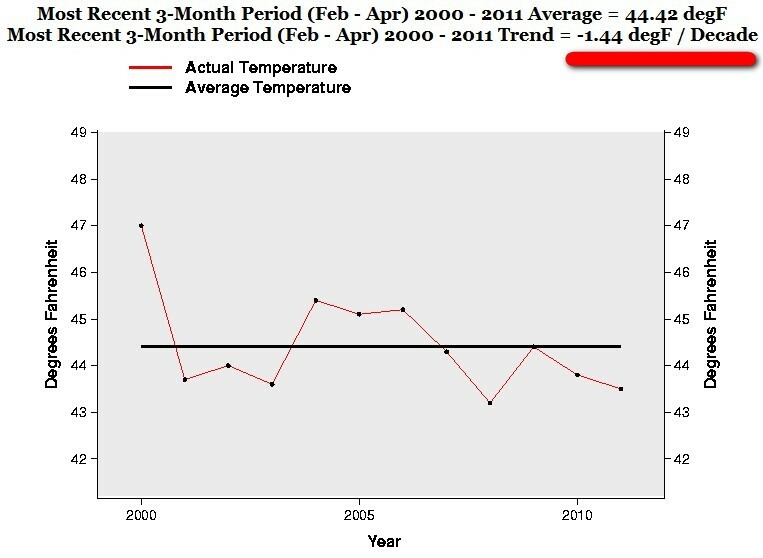 So the “warming trend” 2000-2011 is exactly – 1.44 F degrees COOLER a decade. That is a whopping – 14.4 F COOLER in 100 years. Take cover! 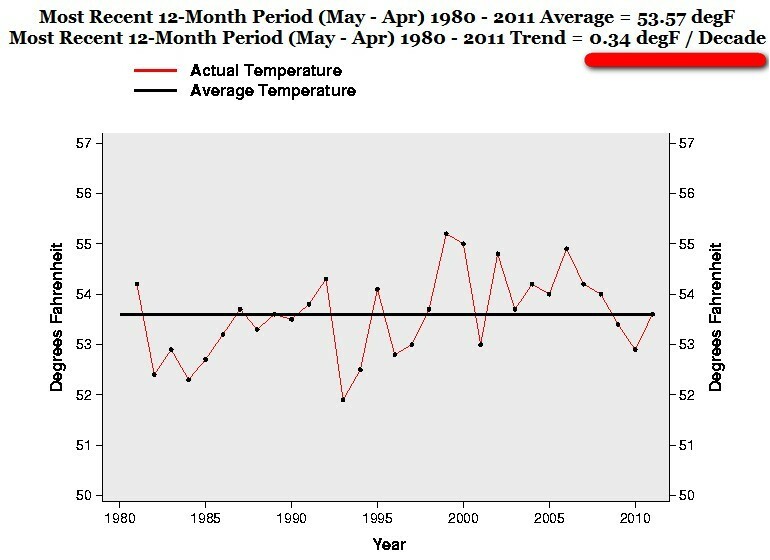 The recent 3 months trend 1980-2011 is exactly 0.18 F degrees a decade. 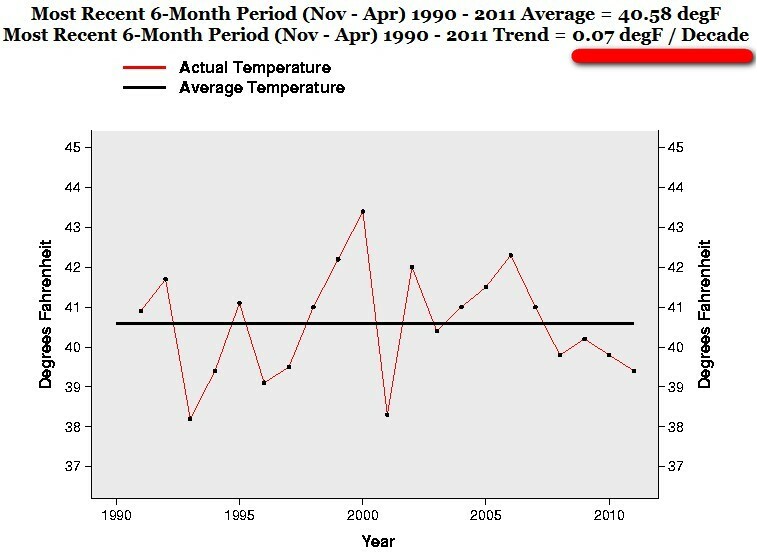 The recent 3 months trend 1990-2011 is exactly – 0.40 F degrees a decade. 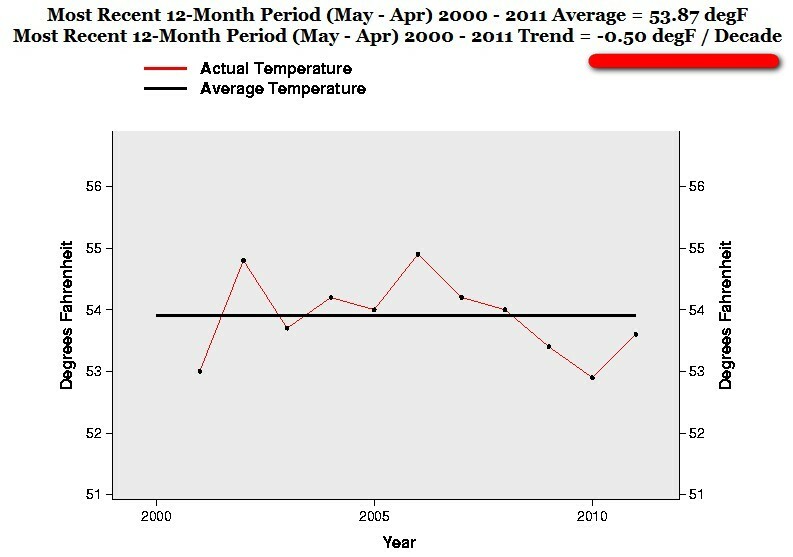 The recent 3 months trend 2000-2011 is exactly – 1.44 F degrees a decade. The official April temperature figures are out. 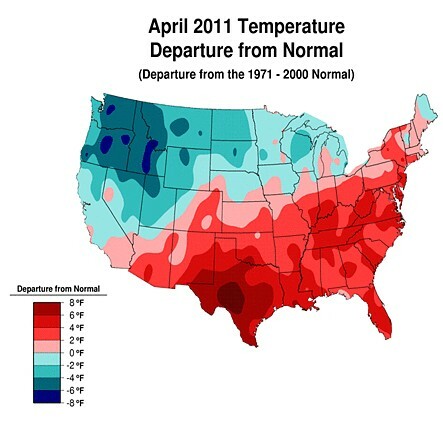 This year, the April temperature is – 3.37 F cooler than 2006, the warmest April. And if we compare this year’s April with 1981 it is – 3.26 F cooler. If we compare with 1946 this year’s April is – 2.62 F cooler. And if we compare with 1915 is – 2.63 F cooler. 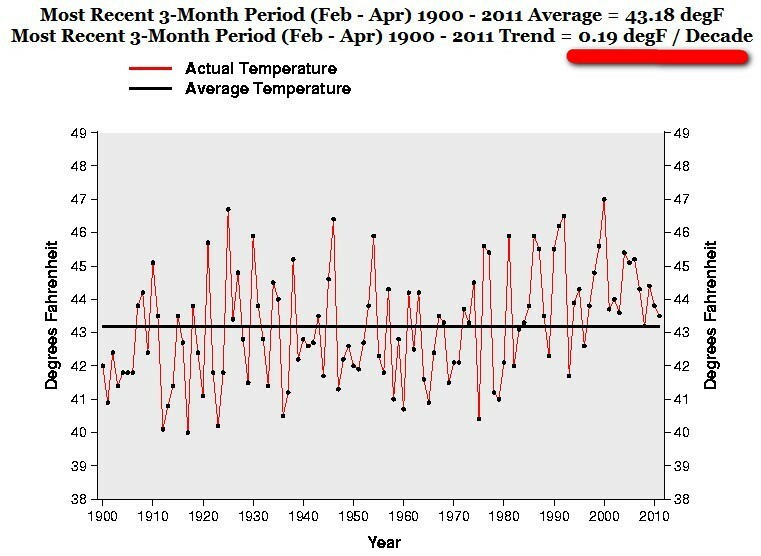 And the “warming trend” 1900-2011 is exactly 0.12 F degrees a decade. That is a whopping 1.2 F warmer in 100 years. Take cover! And notice the dramatic rise from 1907 to 1908. A rise of 5.24 F degrees. And the dramatic rise from 1975 to 1975. A rise of 5.05 F degrees. Or the rise from 1909 to 1910. A rise of 4.79 F degrees. There are other years in the chart when the temperature increases 4.5 – 5.0 F in one year. And still, somehow mysteriously, USA went on as normal. But an ACTUAL RISE OF 5.24 F degrees IN ONE YEAR is nothing.